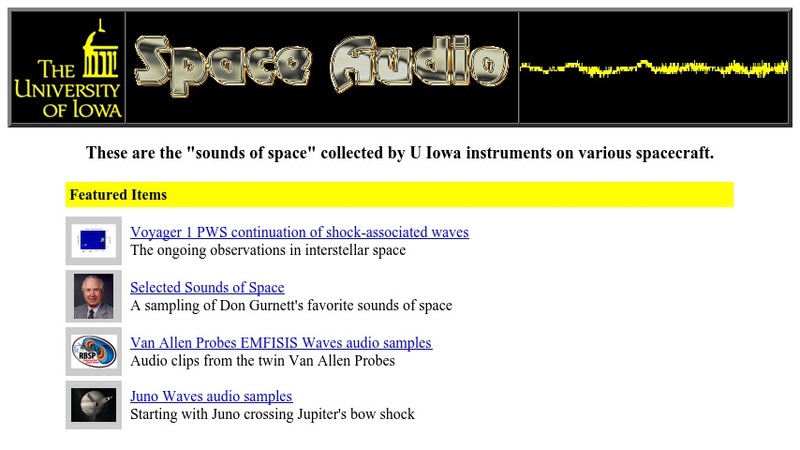 This site offers the "sounds of space" processed from signals received by University of Iowa instruments on various spacecraft. The collection includes sounds from Saturn collected by the Cassini probe, sounds from the edge of the solar system collected by the Voyager probe, as well as radio bursts from solar flares and sounds created by Earth's magnetosphere. There are also descriptions of several types of sounds (whistlers, choruses, and auroral radio emissions) and sample sounds produced by processed data received from specific spacecraft (Galileo, Polar, Cassini, Cluster, and others).